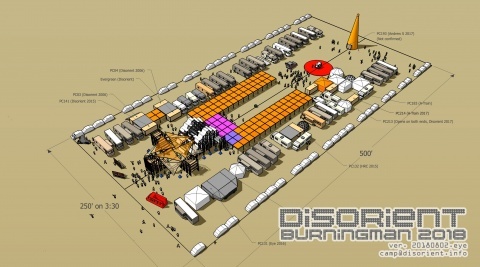 Disorient has been a camp at Burning Man since 2001. 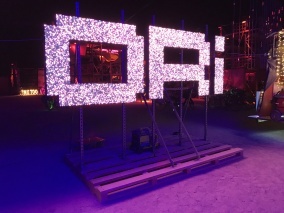 In 2018 Disorient explored 3:30 & Gort. Camp was 250 ft. wide by 500 ft. long. Pod Mahal, Disorient India's vision of a playa "condo" designed as an alternative to RVs was at the heart of camp,. Chand Baori made of 4 inward-facing series of oversized steps extended towards the front and included the Square in which latest flavors of Disorient music, sound art and interactive light installations were served. Sparkling water was available at the H2O Bar. On the other side, the U-shaped Square Shades protected tenters, Amber's Kitchen and our beautiful central lounge from the elements. The Disorient Video Sign (a new creation by Disorient San Francisco) in which each letter is a video screen, a 1.4 million pixels installation, was a remake of the 2005 version of the original Disorient Sign, complete with the ENT part of the Sign on a new art car based on an old fire truck. Our new DIS|CO Lounge spearheaded by Disorient LA provided shaded space for interactive activities such as GlamTech jewelry-making, Pornj garment exchange and ice-cold Minty Towels. A-Train's Duke's and the A-Trium which held JBB's traditional Tuesday night BBQ provided an anchor on the other side of camp. 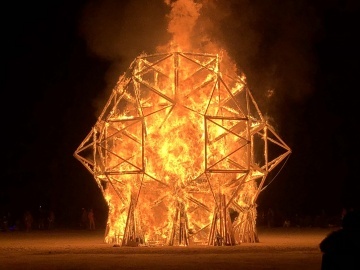 Far from camp, in the deep playa, the Temple of Incompletion by Geodesic Temple was burned on Friday night. In addition to our residents we invite DJs to play on our sound system. 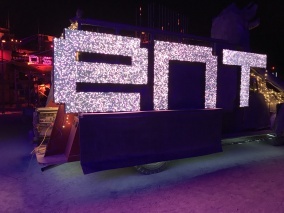 During the week of Burning Man, we set-up a live music stage and invite bands to perform. 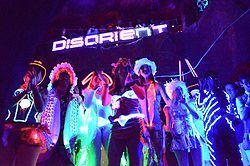 Disorient is a sound, visual and performance art collective. 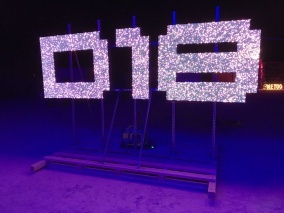 We create art projects and art installations with hardware including wood, scaffolding, palette rack, containers, recycled materials, your body, Raspberry Pi, geodesic domes, inflatable structures, video, repurposed objects, black lights and vehicles. We develop software for our installations. Our guiding principles are outlined in the Disorient Model and in the Political Economy of Disorient. Disorient is an open creative platform powered by love. Our contribution to the vernacular includes Pornj and GlamTech. 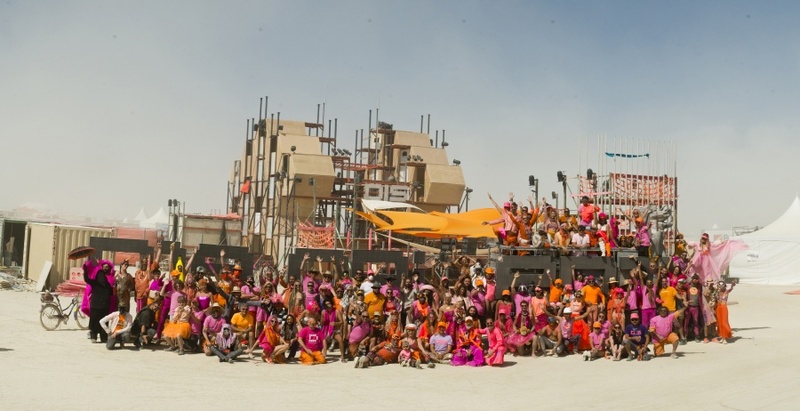 When we are not on the Playa, we organize events, retreats and happenings to raise funds for our art projects on and off playa and support Burning Man. 100% of profit is reinvested in Disorient. 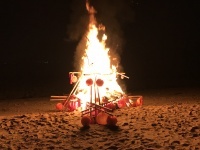 Every year we organize Country Club upstate New York, Bedouin Tech in the desert of Dubai and Fun Tsang on the beach of a tiny uninhabited tropical island in Hong Kong. Those outdoor camping retreats last several days and are aligned with the Burning Man ethos. In 2009 we organized our first fundraisers outside the US in Brazil and Argentina; in 2014, Dubai; in 2016, Hong Kong. 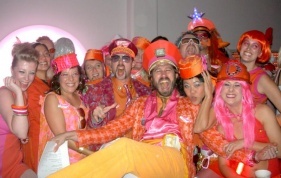 Thousands of DOers (DisOrienters) have camped with Disorient at Burning Man since 2001. About half of those campers are in the US. The other half is distributed in dozens of other countries. We use social networks to stay connected. Too Much Is Rarely Enough.